InterNations in Donostia | Event with Live Music! 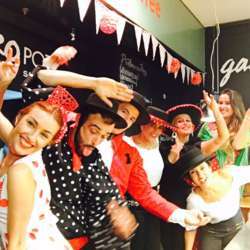 Do you want to have fun with live music, drinks and pintxos? Join us for a thematic Gastro Pote of Mercado San Martin. Everything will be related to "Feria de Abril” of Sevilla. On one hand, we will have the opportunity to enjoy the drink “Rebujito Andaluz” as well as special pintxos from “Feria de abril” during the event. On the other hand "Son de Ases" will play sevillanas and rumbas!! !